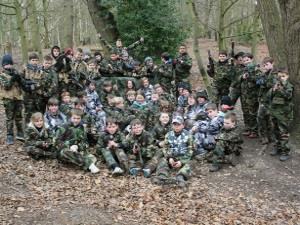 Laser Warfare01277 260001work Lazer GamesOnce you’re kitted up with the latest lasertag guns (all the way from the USA! ), our commanders lead you through a variety of exciting lasertag game scenarios. For parents’ peace of mind, all the lasertag guns are completely harmless - there are no projectiles (unlike paintball) - therefore, no pain and no bruises. And because our laserstag weapons are limitless, you have no need to buy any extra ammo - again, unlike paintball. Our large woodland arena is made up of a mix of natural and man-made made ‘hides’ which help you remain in ‘stealth mode’ as you move around the terrain. Once you’re kitted up with the latest lasertag guns (all the way from the USA! ), our commanders lead you through a variety of exciting lasertag game scenarios. For parents’ peace of mind, all the lasertag guns are completely harmless - there are no projectiles (unlike paintball) - therefore, no pain and no bruises. And because our laserstag weapons are limitless, you have no need to buy any extra ammo - again, unlike paintball. Our large woodland arena is made up of a mix of natural and man-made made ‘hides’ which help you remain in ‘stealth mode’ as you move around the terrain.